Brett Bixler's online professional portfolio. Wondering what badges are? Wondering what's happening with badges at Penn State? Read on! Badges are like digital extensions to an identity. They help learners to establish credibility based on informal learning. They are used to "certify" information that has been consumed by badge earners. This can be assessed or non-assessed learning, ad determined by the badge issuer. For example, we might issue badges to people who are present at a workshop, but we might also require some measurement of comprehension and retention before issuing a badge. Open Badges is a project initiated by Mozilla to create a framework for badge infrastructure. Google has a similar project underway, but it is not nearly as mature. The Mozilla framework consists of three components: 1) Issuer, 2) Earner, and 3) Displayer. An "Issuer" is an organization that can 'award certified badges to learners.' An "Earner" is an individual that can collect badges to represent an accumulation of knowledge, skill or proficiency. 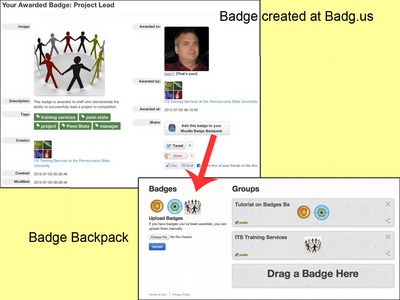 Badges can be placed in an online repository belonging to the user called the "Badge Backpack." With this Backpack, earners can collect, manage, and display the badges they have earned. A "Displayer" is any online presence or service provider that can display badges. Examples of displayers include the blogs, social media sites, and even resumes. An optional fourth component is the "Endorser." An endorser is any organization or individual that signs the badge with their private encryption key, thereby attesting to the badge's value. Here is an example of a simplified badge process. Someone issues me a badge. In this case, Ken Layng of ITS Training Services issued me a "Project Leader" badge, using the tools provided at http://badg.us . I receive an email informing me of this. I go to badg.us, sign in, and send the badge to my badge backpack, part of Mozilla's Open Badges infrastructure. (BTW - I previously created my backpack.) Then I sign into my backpack and accept the badge. From there, I can choose to share it publicly or not, and can send/embed a URL for others to view my badge(s). What are the Potential Benefits to Penn State? Provides a more complete picture of the learner: Badges provide a more granular and complete picture of skills and learning history for potential employers, schools, peer groups and others than a traditional degree. Informal certification: Learners can get credit and recognition for the learning that happens outside of school. e.g., in after-school programs, work experience or online. Signals achievement: Badges signal skills and achievements to peers, potential employers, educational institutions and others. Recognizes new hard skills and literacies: New literacies that are critical to success in today's digital world--like appropriating information, judging its quality, multitasking and networking--are not typically taught in schools and don't show up on a transcript. Badges can recognize these new skills and literacies. Recognizes soft skills: With recognition of social habits, motivation, etc. badges are able to recognize a greater diversity of soft skills than traditional programs measure or even recognize. Badges allow one to share their skill set with the world. This fosters flexibility and connections. Transfer learning across spaces and contexts: Skills are made more portable across jobs, learning environments and places through badges. Build community and social capital: Badges help learners find peers or mentors with similar interests. Community badges help formalize camaraderie, team synthesis and communities of practice. Badges tap into some basic learning psychological principles for the learner. Motivate participation and learning outcomes: Badges provide feedback, milestones and rewards throughout a course or learning experience, encouraging engagement and retention. Unlock privileges: A test becomes a reward. For example, students at a school computer lab might be required to earn a "Digital Safety" badge before being allowed to surf the web. Allow multiple pathways to learning: Badges encourage learners to take new paths or spend more time developing specific skills. Support greater specialization and innovation: Badges can support specialized and emerging fields that are not in traditional learning environments. Badges enable a better understanding of the individual. Capture the learning path and history: With degrees or cumulative grades, much of the learning path -- the set of steps and milestones that led to the degree -- is lost or hard to see. Badges can capture a more specific set of skills and qualities as they occur along the way, along with issue dates for each. This means we can track the set of steps the most successful learners take to gain their skills -- and potentially replicate that experience for others. Assist in Accreditation: By capturing the learning path, meeting the documentation needs of accreditation agencies will be eased. Well, they don't really exist -- yet. Ken Layng of ITS Training Services began investigating badges several months ago, and I've been following the data stream on them for some time. Most of what you've read above comes from Ken's work, so kudos to Ken! Ken organized a Yammer group to invite interested folks in to start looking at this in April 2012, and once we had some preliminary groundwork down, we initiated a meeting with Chris Millet and Chris Stubbs of Education Technology Services, with the hopes we could work together to investigate this from an "all-PSU" perspective. As an aside, this aligns nicely with a desire from ITS senior leadership to approach new opportunities like this from a matrixed organizational view, as opposed to our traditional siloed approach. At Training Services, we're investigating two potential ways to serve badges. One is via a company named BadgeStack. They offer a complete, nearly turnkey solution that includes a humble content-management system. The other is via a cloud provider (http://badg.us) that offers a simple interface to serve badges. Both have potential, but it's just too soon to draw any conclusions or recommendations. ETS is working on a meeting with folks both inside and outside of ITS to gather perspectives, and Training Services will be part of that conversation. Hopefully we'll come away from the meeting with a better perspective on directions to pursue with this great opportunity. There are no conclusions yet, just plenty of questions and investigations. So stay tuned all - this is an exciting new way to capture your learning (and assessment of it), validate it, and display it to the world! Great stuff! I really enjoyed your presentation at the Learning Design Summer Camp as well. I'm also working on a badging program would love to learn more about what you and others are doing across Penn State. Glad you enjoyed the presentation. 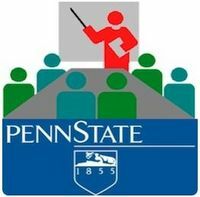 We have a Yammer Group - Digital badges at Penn State - I encourage you to join. Our hope is the online conversations will take place in that area. Please consider posting something about your interests there. If you want to talk, shoot me a few dates/times you have open and we'll talk! Digital Badges - How Do They Work?